There are various ways to air condition a room or a house, and one can either go for window units or central air conditioning. Window units are that sit outside a window and cool a single room. Central air conditioning is controlled by a central thermostat and runs throughout a building or a home, maintaining constant temperature throughout the building. While window units are cheaper on a small-scale, they are not as cost effective for air conditioning a big building and are rather noisy. Central air conditioning is less noisy and maintains a constant temperature throughout the building as well as being more convenient. Heat pumps are a great way for controlling temperature in a building with central air conditioning. Heat pump installation is a great choice for moderate heating and cooling needs whereby the indoor climate is maintained at the desired levels by transferring heat from the house when the weather is warm and transferring heat to the house when the weather is cold. Heat pumps operate differently compared to other cooling and heating solutions one can use in a building as it pumps or redistributes heat rather than generating heat. This translates to a lesser heating and cooling bill. There are many benefits to be had when one goes for heat pump installation. One of them is increased efficiency, especially if the home is well insulated. 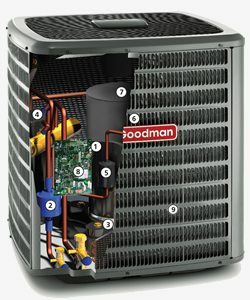 Though costly to acquire and professional help will usually be needed for a heat pump installation, heat pump do not burn gas or oil. The savings made from heating and cooling costs offset the initial high cost and makes it both more energy efficient and cost effective over time. Savings made by increased energy efficiency are around 40% for air source heat pumps and 60% for ground source heat pumps. Not only do heat pumps have lower running costs when compared to other alternatives, they have a longer life expectancy of around 25 years, which is double that of a boiler, but also require less maintenance and safety inspections. Combined with insulation from spikes in fossil fuel prices, the savings are great over a period of time and the lower ownership costs are all a great incentive for one to consider having a heat pump installation. Heat pumps are also more environmental friendly than other cooling and heating solutions since they work by transferring heat within the building and to and from the surrounding air, water source or the ground. No fossil fuels are used and there is no pollution since there is no combustion involved as is the case when using a furnace. A heat pump installation also protects you from the volatility of oil prices which typically spike during winter and require stocking up especially if delivery is not assured or is unreliable. Another reason to go for a heat pump installation is better climate control, air quality in a building and safety. 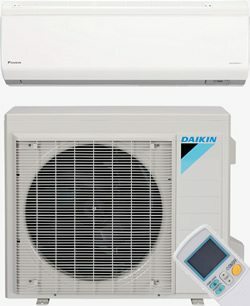 A heat pump controls the climate in every room and keeps them under a constant temperature and since there is no fuel being burnt, there are no fumes or smoke in the air and they do not pose a safety hazard since they can be left running safely at night and people and pets cannot get burnt. Heat pumps also filter the air that circulates in the building making them ideal for those suffering from allergies or asthma. These are just some of the incentives of why one should consider investing in a heat pump installation since they will save you money while you play your part in keeping the planet a greener and better place.